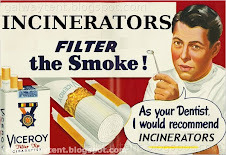 The Galway Tent Blog: Incinerator - EU Policy Will Kill, Wasting Your Money. Incinerator - EU Policy Will Kill, Wasting Your Money. This paper on Particulate matter, science and EU policy concludes that the proposed EU directive on particulate matter (PM) pollution does not adequately reflect the best scientific evidence. Both the W.H.O. and the California standards will prevent more premature deaths than these newest EU standards. The EU standards will give the incinerator-operators a legal shield to reduce expenditure on preventable deaths, boosting management bonuses and stock values for multi-millionaires. However prematurely dead Dubliners, or Dubliners with compromised health, will cost Irish tax-payers large sums of health-care money. Each $10 million saved by the incinerator corporations will cost the taxpayer about $60 million in health care and secondary costs. It seems these compromised EU standards derogations have been "influenced" by Chemical/Incineration-Industry lobby groups in Brussels. This lobby seems to be led by a manufacturer with a disturbing history in the repurposing of pesticides ? TheWorld Health Organization long-term air quality guideline for PM2.5 has been set to 10 µg·m–3. The legally binding annual mean standard in California is set at 12 µg·m–3. The EU proposes a PM2.5 "cap" annual average of 25 µg·m–3 ; this is not legally binding. In addition, the European Commission proposes to allow member states to subtract all natural PM from compliance considerations. The exclusion of all "natural" PM from compliance considerations reduces public health protection from air pollution. In Ireland, both An Bord Pleanala and the Irish EPA have incinetrator-promoter industry insiders on their boards. The Taoiseach openly states that appointments to the boards of state organisations include Friends of The Taoiseach (Irish Times, April 5, 2008, Weekend Review, page 3). With government ministers sacrificing their credibility defending dig-outs what chance is there that members of An Bord Pleanala and the EPA will be allowed to protect Dubliners? Can you provide a reference for this? With details of costs? 1 Epidemiology of Allergic and Respiratory Diseases (EPAR) Dept, INSERM U707, 2 EPAR Dept, UMR–S 707 UPMC Paris 6, Paris, France. 3 Dept of Epidemiology, Rome E Health Authority, Rome, Italy. 4 Center for Research in Environmental Epidemiology (CREAL), Institut Municipal d’Investigació Mèdica (IMIM), Barcelona, Spain. 5 Institute for Risk Assessment Sciences, Universiteit Utrecht, Utrecht, The Netherlands. CORRESPONDENCE: I. Annesi-Maesano, Epidemiology of Allergic and Respiratory Diseases (EPAR) Dept, UMR–S 707 INSERM and UPMC Paris 6, Medical School Saint Antoine, 27 rue Chaligny, 75571 Paris CEDEX 12, France. Fax: 33 147738454. Finally, evidence is accumulating on the most critical issue: are there benefits of exposure reduction? 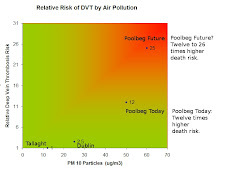 Studies in Dublin, Ireland 37, Switzerland 38 and Germany 39, 40 show that reductions in air pollution and PM are clearly associated with a reduction in health effects. A recent report from the USA indicated that mortality from natural causes decreased following reductions in PM2.5 concentration; these observations came from the Harvard Six Cities study that originally suggested the chronic effects of air pollution 41. In the 11 countries that collaborate within the European APHEIS Network 42, a reduction to a yearly average concentration of PM2.5 of 15 µg·m–3 would result in life expectancy gains, at age 30 yrs, of 1 month to >2 yrs 43. At the EU level, with its 450 million inhabitants, the stakes are even greater. The benefits of more stringent PM standards to both general and susceptible populations would be large 44. Although implementing more stringent air pollution legislation requires more resources, detailed cost-benefit calculations commissioned by the EU have shown that health benefits gained from reduction of PM2.5 in Europe clearly outweigh these costs. [Washington Post, 27 September 2003]. The UK could save £24 billion per annum in NHS costs by following the US clean air strategy. For every £1 spent on reducing PM2.5s there will be a saving of £6 on reduced NHS costs and £4 on reduced Social Security costs as fewer people will be too sick to work [EC's 1999 OKOPOL Report]. The European Union could save up to 161 billion euros a year by reducing deaths caused by air pollution, the World Health Organization has said. Air pollution reduces the life of the average European by 8.6 months. "Measures to reduce the effects of air pollution on health and extend life expectancy already exist and work," said Dr Marc Danzon, WHO Regional Director for Europe. The primary standards for PM2.5 are set at 15 μg/m³ and 65 μg/m³, respectively, for the annual and 24-hour NAAQS. The secondary standards are identical to the primary standards. Given the legal status of the PM NAAQS, the PM10 NAAQS established in 1987 is in effect. The primary, or health-based, PM10 NAAQS include both short and long-term standards. The short-term (24-hour) standard of 150 μg/m³ is not to be exceeded more than once per year on average over three years. The long-term standard specifies an expected annual arithmetic mean not to exceed 50 μg/m³ averaged over three years. The secondary, or welfare-based, standards are identical to the primary standards. Comment moved from duplicate posting. The EPA proposed lowering the level of the 24-hour fine particle standard but keeping unchanged the annual standard, set in 1997.